Three Pakistani climbers Imran Junaidi, Usman Tariq and Khurram Rajpoot are missing on Sarwali/Toshi Ri peak since August 31st. Sarwali with approximate altitude of 6000 meters is unclimbed and highest peak of AJK, climbers were seeking to make first ascent of peak from south face which is accessible from upper domail, Kashmir side. Last communication with base took place on Aug 31st, climbers were at 5700 meters and they were set on the ridge in a bivouac. Owais Khattak tried to contact them several times after that but there was no contact due to distortion, which means something was blocking signals. 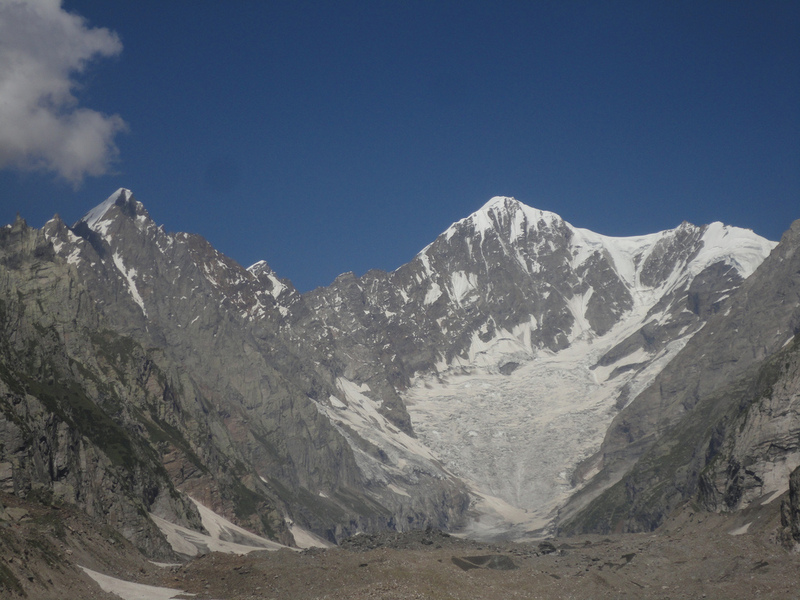 Sarwali, Mazeno Ridge and Tarashing Glacier. Emergency was declared on Sep 04 by Owais Khattak, and they decided to put together a rescue team of locals to start with. A rescue team consisting of locals reached base camp on Sep 07 with coordination of local police and administration. 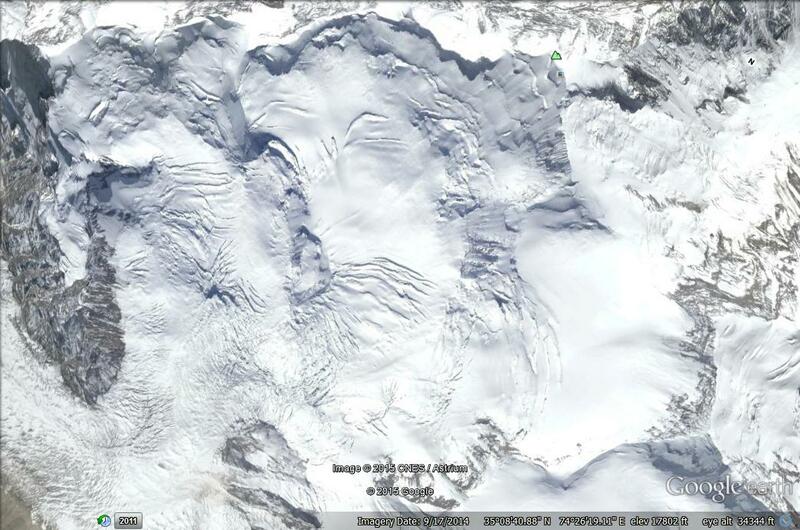 Rescue team was suppose to report within 24 hours, but there is still no news from them. A meeting between officials of Alpine Club of Pakistan and other stake holders took place and they decided to send another rescue team comprising Saad Tariq, Dr. Naveed and some climbers of AJK Alpine club. 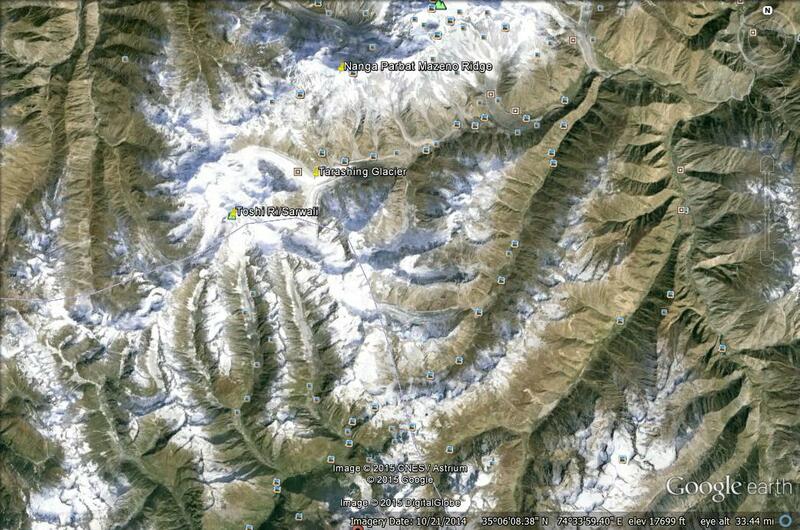 The second rescue team is expected to reach base camp today Sep 09. Sarwali South Face from Kashmir side. Pakistan army sent helicopters today and they searched the area from Kashmir side, no trace was found of missing climbers, Col. Rtd. Abdul Jabbar Bhatti was leading the helicopter search. More flights are expected today to search the mountain from Nanga Parbat side. A reliable source from rescue team told me that there is no possible escape route on NE face (Nanga Parbat, Tarashing side), that side infected with hanging seracs and cornices. Rescue team is still hopeful, helicopter search and on ground search operation will continue, second rescue team is expected to report back in next 24 hours. Sarwali NE face from Nanga Parbat side. Imran Junaidi and Usman Tariq are one of the very few professional rock climbers in Pakistan. Pakistani duo climbed Trango Tower in 2014; they are only Pakistani climbers to climb Trango. Khurram Rajpoot explored Kohistan area, and explored several lakes and unclimbed trekking peaks. 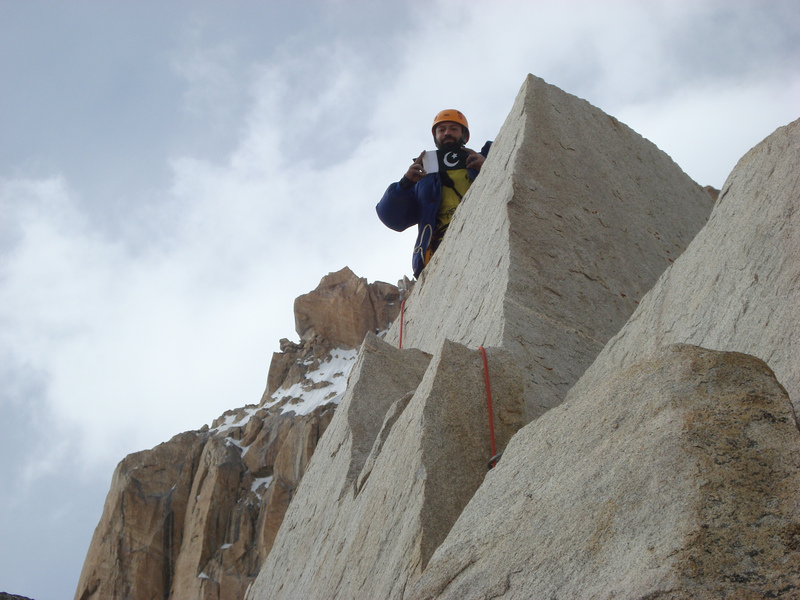 Imran Junaidi on Trango summit i 2014.